A rash of injuries during the final week of spring training last year forced the Miami Marlins to add then 20-year-old right-hander Jose Fernandez to its starting rotation. This year won't provide nearly as much suspense for the reigning rookie of the year. 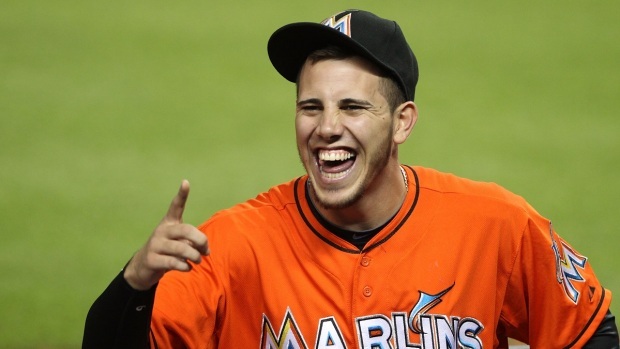 "Last year I was trying to make the team," Fernandez said. "This year I think that I am on the team, so I'm going about it a little different." Despite never before pitching above the Florida State League, Fernandez baffled major league hitters during a rookie season in which he went 12-6 with a 2.19 ERA and finished third in the NL Cy Young Award voting. Fernandez and the rest of the Marlins' pitchers and catchers reported to Roger Dean Stadium on Sunday for the first time this spring. He acknowledged the talk of a sophomore slump from outsiders, but isn't worried about falling into one. "I heard about it," Fernandez said. "A lot of guys have said that. I don't know, anything can happen, but, man, I'm feeling well. I'm feeling really, really good." Marlins manager Mike Redmond shares Fernandez's assessment. "The league has seen him now, but at the same time, too, he's so talented and has such good stuff," Redmond said. "I have no worries that he is going to make that adjustment as well." Following morning physicals and meetings, the Marlins took to the back fields. Fernandez and veteran catcher Jarrod Saltalamacchia, the Marlins' most notable offseason free agent signing, spent the better part of the past week getting to know each other during multiple public appearances. On Sunday, Saltalamacchia caught Fernandez's 32-pitch bullpen session. "Obviously, first day, everyone is here, a little amped up, but you can tell he has such a great feel for his pitches — well above his years when it comes to that," Saltalamacchia said. Saltalamacchia's main goal for the spring is to build a rapport with the young starters, none of whom are likely to be older than 29. "I've had a chance to know Salty a little bit already, and I can see it is going to be a blast," Fernandez said. "I can see it is going to be a lot of fun, and we are going to enjoy it a lot. It's going to happen." Fernandez will lead a rotation expected to include 23-year-old Henderson Alvarez and 24-year-old Nathan Eovaldi. A smooth spring should ensure a spot in the rotation for Jacob Turner, 22, leaving a handful of young pitchers, led by Kevin Slowey and Tom Koehler, vying for the fifth spot. The core of young, talented arms and additions like Saltalamacchia and veteran Rafael Furcal at second base, who, along with other position players isn't required to report until Thursday, has Redmond expecting noticeable progress from the club that went 62-100 last season during his first year at the helm. "There is a buzz about this ball club," Redmond said. "I know these guys feel it, and for the guys that were here last year, I think they are excited knowing that we went out and added some pieces to this ball club. Now it's just a matter of not talking about it and going out there and doing it."